Before tak­ing up the sub­ject, it is nec­es­sary to point out that Social­isme ou Bar­barie, pri­mar­ily at the impe­tus of Cas­to­ri­adis (alias Chaulieu), went through dif­fer­ent peri­ods, largely cor­re­spond­ing to polit­i­cal analy­ses of the prospects of strug­gle which con­di­tioned the devel­op­ment of the group. If one can schemat­i­cally dis­tin­guish a Marx­ist period from a non-Marxist period, with the new posi­tions of Cas­to­ri­adis and the split of Pou­voir Ouvrier (Marx­ist ten­dency) in 1963, the pre­ced­ing period, begin­ning in 1949, went through dif­fer­ent approaches in the analy­sis of the eco­nomic, social, and polit­i­cal sit­u­a­tion not only in France, but also in the entire world. In these dif­fer­ent ori­en­ta­tions, which are easy to detect in the 40 issues of the review, the ques­tion of work­ers’ inquiry was only posed in peri­ods dur­ing which the group affirmed the pri­macy of the class strug­gle. It might be worth recall­ing that the Chaulieu-Montal tendency’s break with the Parti Com­mu­niste Inter­na­tion­al­iste and the Fourth Inter­na­tional hap­pened over the ques­tion of the nature of the USSR; and at the same time, and for sev­eral years, the group essen­tially fixed its atten­tion on the com­ing of the Third World War. But it could show an inter­est in the work­ing class in the form of tes­ti­monies, as is demon­strated by the pub­li­ca­tion, from the first issue of the review, of a trans­la­tion of Paul Romano’s text – The Amer­i­can Worker – and some reports on strikes in both France and abroad. But, then, it was never a ques­tion of work­ers’ inquiry and one can­not say that the class strug­gle and an attempt to under­stand the world of the worker were at that time pri­mary con­cerns of the group. 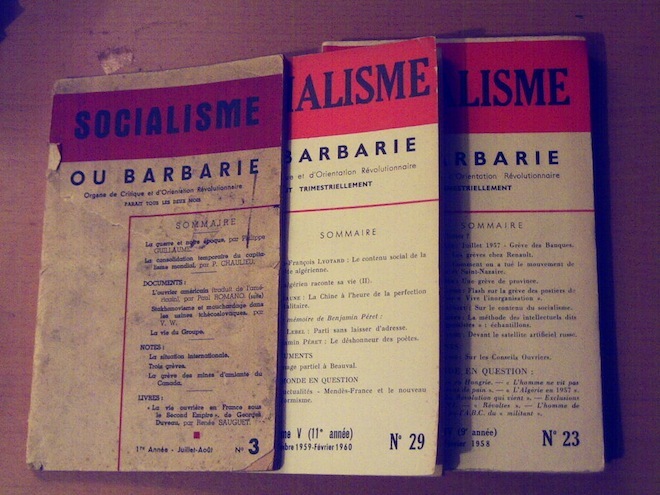 Per­son­ally, I par­tic­i­pated in Social­isme ou Bar­barie from 1952 to 1958. I left Social­isme ou Bar­barie with Claude Lefort (Mon­tal) after an attempt by the major­ity of the group to cre­ate a polit­i­cal party dur­ing the events bound up with the war in Alge­ria and the Gaullist semi-coup. This rup­ture hap­pened over purely orga­ni­za­tion con­sid­er­a­tions that did not directly put into ques­tion the inter­est in the action of the work­ing class. On the con­trary, the major­ity saw in Gaullism a kind of fas­cism (which was an incor­rect analy­sis), and drew the con­clu­sion that we were going to par­tic­i­pate in a work­ers’ revolt, hence the neces­sity of a struc­tured orga­ni­za­tion. This ori­en­ta­tion was, how­ever, in oppo­si­tion to the con­cept of work­ers’ inquiry because the group saw itself, at that time, as a guide, a coor­di­na­tor, a recruiter aim­ing to impose a line rather than draw­ing this line from an analy­sis of work­ers’ behav­ior. I would not know what to say about what really hap­pened after 1958 – because I was no longer a part of it – except to com­ment on the texts pub­lished by the review, or to trust what my con­tacts in the group could tell me. Social­isme ou Bar­barie would like to solicit tes­ti­monies from work­ers and pub­lish them at the same time as it accords an impor­tant place to all forms of analy­sis con­cern­ing pro­le­tar­ian expe­ri­ence. In this issue the reader will find the begin­ning of such a tes­ti­mony, one that leaves aside sev­eral of the points we have out­lined.1 Other such texts could broach these points in ways that go beyond those envi­sioned in this issue. In fact, it is impos­si­ble to impose an exact frame­work. If we have seemed to do so in the course of our expla­na­tions, and if we have pro­duced noth­ing but a ques­tion­naire, then this work would not be valu­able: a ques­tion imposed from the out­side might be an irri­tant for the sub­ject being ques­tioned, shap­ing an arti­fi­cial response or, in any case, imprint­ing upon it a char­ac­ter that it would not oth­er­wise have had. Our research direc­tions would be brought to bear even on nar­ra­tives that we pro­voke: we must be atten­tive to all forms of expres­sion that might advance con­crete analy­sis. As for the rest, the prob­lem is not the form taken by a doc­u­ment, but its inter­pre­ta­tion. Who will work out the rela­tion­ships under­stood as sig­nif­i­cant between such and such responses? Who will reveal from beneath the explicit con­tent of a doc­u­ment the inten­tions and atti­tudes that inspired it, and jux­ta­pose the tes­ti­monies? The com­rades of Social­isme ou Bar­barie? But would this not run counter to their inten­tions, given that they pro­pose a kind of research that would enable work­ers to reflect upon their expe­ri­ence? This prob­lem can­not be resolved arti­fi­cially, par­tic­u­larly not at this first step in the work. In any case, the inter­pre­ta­tion, from wher­ever it comes, will remain con­tem­po­rary with the text being inter­preted. It can only impress if it is judged to be accu­rate by the reader, some­one who is able to find another mean­ing in the mate­ri­als we sub­mit to him. We hope it will be pos­si­ble to con­nect the authors with texts in a col­lec­tive cri­tique of the doc­u­ments. For the moment, our goal is to gather these mate­ri­als: in this, we count on the active sup­port of those sym­pa­thetic with this journal. All of this talk ends in this deci­sion to put aside work­ers’ inquiry in favor of the first-hand nar­ra­tive of a sin­gle per­son, when one knows what Social­isme ou Bar­barie really was at that time: a core of some dozen mil­i­tants with a few con­tacts in the provinces and review that cir­cu­lated barely more than 200 copies. It was out of the ques­tion, for purely prac­ti­cal rea­sons to start any kind of “work­ers’ inquiry,” even less because only three or four of these par­tic­i­pants were pro­le­tar­i­ans. Did this crit­i­cal rejec­tion not express the con­crete impos­si­bil­ity of real­iz­ing this work, given the size of the group? Or rather, was it not the con­se­quence of a polit­i­cal approach to the ques­tion – that the group had noth­ing to learn from the work­ing class but, on the con­trary, had sev­eral things to teach it? (This con­nects to the posi­tions on the role of the orga­ni­za­tion that exploded in 1958 in the polit­i­cal tur­moil of the war in Alge­ria.) In fact, the review would only include, fol­low­ing The Amer­i­can Worker by Paul Romano men­tioned above, nar­ra­tives from the pro­le­tar­ian mem­bers of the group. There is clear evi­dence that these nar­ra­tives were influ­enced by the polit­i­cal vision of the group; this was par­tic­u­larly true, for exam­ple, with the Mothé’s nar­ra­tives on the Renault Bil­lan­court fac­tory, which were strongly influ­enced by the Cas­to­ri­adis’ positions. The pub­li­ca­tion of this text on “Pro­le­tar­ian Expe­ri­ence” coin­cided with the devel­op­ment of strug­gle in France, notably the large strikes in 1953 and 1955, up until 1958, when the polit­i­cal prob­lems tied to the war in Alge­ria gained the upper hand over the life of the group, the dis­cus­sions in the group, and the arti­cles in the review, priv­i­leged the work­ers’ strug­gles and the nar­ra­tives in ques­tion, but at no moment did the ques­tion of “work­ers’ inquiry” posed in 1952 reap­pear. On the con­trary, innu­mer­able debates unfolded in the weekly meet­ings on the ques­tion of a work­ers paper. Such a paper existed, clan­des­tinely, Tri­bune Ouvrière, oper­ated by group of work­ers at the Renault fac­tory in Bil­lan­court (a sub­urb of Paris), a few of whom were close to Social­isme ou Bar­barie (one was a member). To recount the his­tory of Tri­bune Ouvrière, work­ers bul­letin of the Renault fac­tory at Bil­lan­court neces­si­tates retrac­ing the sit­u­a­tion in the fac­tory and the rela­tions of labor in the fif­teen years that fol­lowed the Sec­ond World War. To broadly sum­ma­rize, this fac­tory of about 30,000 work­ers, the “work­ers’ fortress,” as we used it call it at the time, was then dom­i­nated by the CGT, tied closely to the Com­mu­nist Party, and which until 1947, imposed the management’s pro­duc­tion imper­a­tives. It was in line with the national polit­i­cal union for the eco­nomic recon­struc­tion of cap­i­tal­ism in France. The class strug­gle con­tin­ued nonethe­less, and Trot­sky­ist mil­i­tants suc­ceeded in polar­iz­ing oppo­si­tion against this pol­i­tics of class col­lab­o­ra­tion in cer­tain work­shops in the fac­tory, and in unleash­ing in April-May 1947 a wild­cat strike and the cre­ation of a strike com­mit­tee out­side the union. The vio­lent repres­sion of the strike ended with a com­pro­mise (signed by the CGT with­out the pres­ence of the strike com­mit­tee), but had polit­i­cal con­se­quences: the ejec­tion of the Com­mu­nist min­is­ters from the gov­ern­ment (other fac­tors also con­tributed to this ejec­tion: on the one hand, the begin­ning of the cold war and align­ment on the pol­i­tics of the USSR, and on the other hand, the first war in Viet­nam). The end of the strike saw the exclu­sion of the CGT from those sec­tions that had launched the strike, which had to cre­ate a new union, the Renault Demo­c­ra­tic Union (SDR), led by a Trot­sky­ist mil­i­tant, Bois. The exis­tence of this union was very ephemeral because it clashed with both the CGT and the man­age­ment (the legal arrange­ment prac­ti­cally pro­hib­ited it from par­tic­i­pat­ing in any dis­cus­sion in the factory). There were attempts to turn Tri­bune Ouvrière into the worker bul­letin of Social­isme ou Bar­barie; these dis­cus­sions aimed to define the method of such a bul­letin, which was intended to prop­a­gate the ideas of the group, rather than to pro­mote a deeper under­stand­ing of the pro­le­tariat. After 1958, and the group’s split, such a paper appeared under the title Pou­voir Ouvrier. No longer a mem­ber of Social­isme ou Bar­barie after this date, I can only refer to pub­li­ca­tions in order to main­tain that the ques­tion of Work­ers’ Inquiry was never addressed in the group, and even more so that even the worker nar­ra­tives dis­ap­peared [from the review] com­pletely, the group being in large part com­posed of intel­lec­tu­als and stu­dents, and no proletarians. The debates that, in 1958, led to Social­isme ou Barbarie’s split, were polar­ized around two texts on the role of the orga­ni­za­tion, one com­ing from Cas­to­ri­adis, the other from Lefort. In this lat­ter text one finds a brief ref­er­ence to work­ers inquiry in the con­clu­sion on “mil­i­tant activ­ity” in these terms: “On the other hand, one can begin sev­eral seri­ous analy­ses con­cern­ing the func­tion­ing of our own soci­ety (on the rela­tions of pro­duc­tion, the French bureau­cracy, or the union bureau­cracy). One would in this way estab­lish a col­lab­o­ra­tion with fac­tory mil­i­tants in a way that poses in con­crete terms (through inquiries into their life and work expe­ri­ences) the prob­lem of work­ers’ man­age­ment.”2 But even there this remained a purely the­o­ret­i­cal posi­tion with­out the pos­si­bil­ity of prac­ti­cal real­iza­tion given the reduced size of the group and, in fact, every­thing would unfold differently. In a cer­tain way, one can say that this approach to under­stand­ing the pro­le­tar­ian milieu was adopted by those who emerged, after the var­i­ous tur­moils that lasted up until 1962, as the minor­ity that was more or less excluded from Social­isme ou Bar­barie in 1958. It would take too long to explain how, from the autumn of 1958, we con­sti­tuted an “inter-firm group” com­posed solely of pro­le­tar­i­ans, and which began to pub­lish a monthly bul­letin essen­tially repro­duc­ing what the par­tic­i­pants could say about what­ever hap­pened in their fac­tory. This bul­letin ended up call­ing itself Infor­ma­tions Cor­re­spon­dance Ouvrières (ICO)3 and con­tin­ued under this form until 1968 where, once again, an influx of stu­dents fun­da­men­tally mod­i­fied the orig­i­nal char­ac­ter of the group and the con­tent of the bul­letin. In a cer­tain way this resem­bles work­ers’ inquiry, but it was in no way a response to pre­cise ques­tion­naire, but a nar­ra­tive, even­tu­ally clar­i­fied by ques­tions to other pro­le­tar­i­ans par­tic­i­pat­ing in the meet­ing. I must add that until 1967-1968, when eco­nomic and social devel­op­ment sparked a revival of inter­est in this expe­ri­ence, the mem­ber­ship of ICO never sur­passed more than 30, the bulletin’s cir­cu­la­tion hav­ing finally attained 1000 copies, and that the influ­ence of the group remained neg­li­gi­ble all the same. Tri­bune Ouvrière dis­ap­peared around 1962-63 because Ray­mond left – and he took with him a cer­tain num­ber of Renault work­ers – to cre­ate a col­lec­tive vaca­tion cen­ter. In the years before 1958 dis­cus­sions went on in Social­isme ou Bar­barie about a “work­ers’ paper” that would express the group’s posi­tion on work­ers’ strug­gles to the work­ers. For some time some in Social­isme ou Bar­barie had thought that Tri­bune Ouvrière would be this work­ers’ paper express­ing the group. But the oppo­si­tion of Ray­mond and the other mem­bers (except Mothé, who pushed for such an inte­gra­tion), nul­li­fied all these efforts. It was then that the major­ity, tak­ing advan­tage of the 1958 split, launched the work­ers’ paper of the group: Pou­voir Ouvrier. It was nei­ther the con­tin­u­a­tion of Tri­bune Ouvrière, which con­tin­ued for some time in its orig­i­nal form, nor some for­mula that cor­re­sponded to it, but the paper of a polit­i­cal group car­ry­ing, in more acces­si­ble lan­guage, the good word to the work­ers: it did not base itself on any con­crete work­ers expe­ri­ence. This was so true that at the time of Social­isme ou Barbarie’s new split in 1963, “Pou­voir Ouvrier” became the name and the polit­i­cal organ of the new group. After 1958 Mothé founded the paper accord­ing to the for­mula he defended in the review, but he quickly aban­doned it to pur­sue a union career in the CFDT. ICO dis­ap­peared after 1968 in large part because of pro­found diver­gences over the role of the pro­le­tariat, some fore­see­ing a rise in strug­gles, which would jus­tify a rev­o­lu­tion­ary per­spec­tive (which led to the reemer­gence of the old debates on the role of orga­ni­za­tions and an irre­ducible cleav­age between the Marx­ist and anar­chist cur­rents); oth­ers think­ing the role of the pro­le­tariat was no longer cen­tral to the prospects of a com­mu­nist trans­for­ma­tion of soci­ety. These are the cur­rents that still con­front each other 40 years later, but the least that can be said is that nei­ther one con­cerned itself with really know­ing how pro­le­tar­i­ans live and strug­gle, and their vision of a non-capitalist world. For these cur­rents – even though a whole arse­nal of soci­ol­o­gists and eth­nol­o­gists around the world try to tap into this in order to fur­ther the dom­i­na­tion of the worker how­ever they can, with the sole inter­est of ensur­ing the per­ma­nence of the sys­tem that exploits labor-power – the theme of work­ers’ inquiry is no longer rel­e­vant: for some it is totally use­less, because the work­ers are no longer a deter­min­ing fac­tor; for oth­ers, as in the past, it is a sec­ondary thing, because they still think they have to teach some­thing to work­ers, and not the other way around. Henri Simon	was a member of Socialisme ou Barbarie. 1. G. Vivier, “La vie en usine,” Social­isme ou Bar­barie no. 11. 2. Claude Lefort, Élé­ments d’une cri­tique de la bureau­cratie (Paris: Gal­li­mard, 1979), 112. 3. This is some­times writ­ten as Infor­ma­tions et Cor­re­spon­dance Ouvrières, but we have left Simon’s phras­ing.